Julene Hallo, Clinical Trials Coordinator in the Women’s Oncology and Dysplasia unit has been honoured for her remarkable contribution to her work and to cancer research, receiving the 2018 Woodward Family Medal of Excellence. Announced at the Women’s annual Staff Awards on 23 August, Julene, who works with cancer patients, was described by her peers as a person who “embodies everything the Women’s is about”. “Julene has many, many special gifts but I think above all, it’s her absolute love and care for her patients. She has been an absolute icon to her unit and for patients since 1987,” former head of Oncology, Professor Michael Quinn said. Director of Oncology and Dysplasia Orla McNally said Julene’s dedication to recruiting patients to clinical trials was unlike any other. “The national average for recruitment to clinical trials is about six percent and at times in gynaecology at the Women’s we’ve been up at 30 per cent and there is one person who is significantly responsible for that high percentage,” Assoc. Prof McNally said. Julene trained in general nursing and midwifery at the Women’s more than 40 years ago, eventually moving onto outpatients and then onto special clinics where she developed an interest in oncology and oncology research. 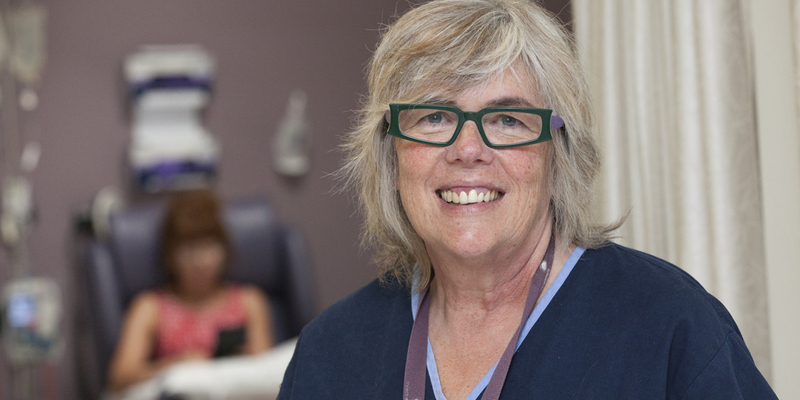 “My job is important because you make a difference to women with ovarian cancer,” Julene said. The Woodward Family Medal of Excellence is the highest honour awarded at the annual Women’s Staff Awards. It recognises the extraordinary achievements over 10 years of an individual, which have contributed significantly to improving the health of women and/or newborns. The Women’s CEO Dr Sue Matthews congratulated all the 2018 award and years of service recipients. “This evening we recognise our colleagues who truly demonstrate the Women’s values of courage, passion, discovery and respect. These individuals’ passion and support for the Women’s have helped to make us the organisation we are today – putting women, babies and their families at the heart of everything we do,” Dr Matthews said. The positive atmosphere in the Women’s chemo room can be attributed directly to our oncology staff – a key member of which is Julene Hallo, Senior Research Nurse Gynaecology and Oncology Clinical Trials.